Haggis is Scotland’s national dish and is so delicious, it really should not be limited to once a year. In an effort to encourage everyone to celebrate the the peppery spices of the humble haggis, we are promoting wonderful dinner party menus and recipes created by world renowned chefs. Today, we are featuring the wonderful Burns Night Supper menu created by top Scottish chef, Shirley Spear from The Three Chimneys Restaurant on the Isle of Skye. If you are travelling to Scotland soon, Shirley’s restaurant is definitely worth the journey. Her dishes are a celebration of all that is good with Scottish food today. 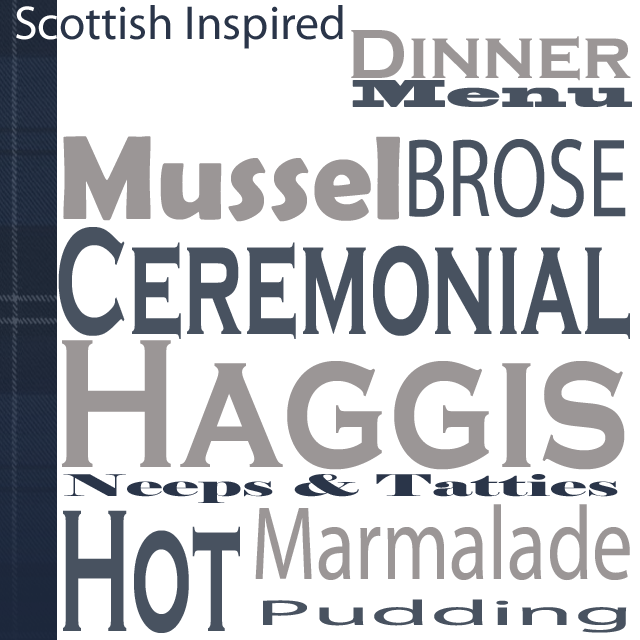 In the meantime, why not order haggis from HaggisUK.co.uk and impress your friends with this Scottish inspired dinner menu. Wash and scrub them in running water to remove sand and grit, remembering to throw away any that are open as these are likely to give you quite a stomach ache if eaten. Then find a large pan with a firm fitting lid. Melt the butter, add the onion and garlic and stir until they are soft and translucent in the buttery juices. Stir in the parsley and add some freshly ground black pepper. Pour in the wine and water and bring to the boil. Remove the mussels using a slotted spoon and leave in a large dish to cool. Strain the cooking liquor through a fine sieve and reserve. Stage Two. Making the brose. 500 grams potatoes, weighed when peeled and diced. Choose a floury variety that is good for mash. 200 grams onion, weighed when peeled and chopped quite small. 50 grams slightly salted butter. 2 rounded tablespoons medium oatmeal. Approximately 250mls fresh milk plus 150mls double cream. Freshly ground salt, black pepper, chopped chives and parsley, to finish. Melt the butter until hot and foamy. Add potatoes and stir together with the onion. Allow to cook gently for a few minutes. Pour in the strained mussel liquor. Bring to boil and then simmer with the lid on for at least 20-30 minutes. Add oatmeal, stir and simmer for a further 5-10 minutes. Meanwhile, remove the cooled mussels from their shells and reserve in a bowl. Retain a few whole for garnish. When brose is cooked, add fresh milk and liquidise. Stir in shelled mussels and the double cream. Reheat and season to taste. Be careful, as salt may not be necessary. Adjust the thickness of the brose at this stage. You may need to add a little more cream or a dash of white wine and water. Finish with freshly chopped chives and parsley stirred through the brose. Serve hot in warmed bowls with whole mussels placed on top for garnish. Haggis can be bought from good butcher’s shops, in many supermarkets and online here too. Vegetarian versions are also available so no-one needs to miss out. The haggis is already cooked and just needs some careful re-heating until it is piping hot. Place the haggis in the pan and turn the heat down immediately. The water should only simmer, not boil as this may burst the case resulting in a culinary disaster and a ‘murdert haggis’. Wrapping it in foil would help to protect the contents. The length of time it should be gently poached depends on the size of your haggis. As a guide, a 1kg haggis takes around 75 minutes. But there are usually clear instructions on the packet. We’ve not specified an amount of neeps or tatties here as it is really determined by how hungry you think your guests will be. As a general rule. we’d recommend for 500g of potatoes and 1 large turnip for every four people around your table. Butter a 3-pint pudding basin well. Place the breadcrumbs, flour and sugar in a large mixing bowl. Melt the butter together with the marmalade, in a saucepan over a gently heat. Pour the melted ingredients over the dry ingredients and mix together thoroughly. Last of all, dissolve the bicarbonate of soda in 1 tablespoonful of cold water. Stir this into the pudding mixture, which will increase in volume as it absorbs the bicarbonate of soda. Spoon the mixture into the prepared basin. Cover it with close-fitting lid, or alternatively, make a lid with circles of buttered greaseproof paper and foil, pleated together across the centre and tied securely around the rim of the basin. Place the pudding basin in a saucepan of boiling water. The water should reach halfway up the side of the basin. Cover the pan with a close-fitting lid and simmer the pudding for 2 hours. The water will need topping-up throughout the cooking period. Turn out on to a serving dish, slice and serve hot, with fresh cream, ice cream, or – as is done at Three Chimneys – with Drambuie Custard. This is a proper egg custard flavoured with Drambuie liqueur. It is served warm, poured around the pudding. Alternative flavours could be added, if you prefer, such as vanilla, ginger, or crushed cardamom. Or a tablespoonful of fresh ground coffee, which is delicious with hot or cold chocolate desserts. Whisk the egg yolks together with the sugar until pale, slightly thick and creamy. Pour the milk and cream on to the egg and sugar mixture and whisk together. Bring to the boil very slowly, stirring all the time. As soon as it begins to thicken, or coats the back of the wooden spoon, remove from the heat and pour into a bowl or jug for serving. Stir in the Drambuie, or flavouring of your choice. Alternatively, cool the custard quickly in a bowl sitting on ice and refrigerate when cold, until required. The custard can be used cold for assembling a trifle, serving with frozen or chilled desserts, or reheated carefully for serving with a hot pudding. Whatever your menu, we hope you have a wonderful Burns Supper celebrations. And remember you can order your haggis here.